Give your customers something to love: wonderful, personalized banking experiences that go well beyond customer expectations. As a cloud enabled service Odigo helps banks deliver a true omni-channel customer experience recognizing a customer segment of one. It increases agent efficiency and reduces servicing costs. We’ve taken the pain out of creating customer experiences that delight and engage customers by putting the highly personalized, human touch back into customer service. It’s so efficient; it reduces costs and is a pleasure for your agents to use. For customers to select a bank as their “preferred provider”, quality of service and ease of use remain the primary factors where bankers can differentiate. The variety of channels and devices that customers use to interact with banks has risen sharply thanks to the Internet and mobile revolution. Yet, no matter how they contact their bank, they expect to reach the right service agent and receive a personalized response every time. Banks need to be capable to allow customers to start a transaction on one channel and complete it on another. Real-time access to customer information helps reduce transaction time and better equips advisors to proactively address customer needs. Our Odigo Solution for Banking enables financial institutions to manage multichannel customer interactions intelligently, create opportunities to right-sell and cross-sell, and improve customer agent productivity. Odigo seamlessly integrates with your CRM systems so that your agents benefit from a complete view of the customer information on a single screen in real time. The one single multichannel hub routes a customer contact from any touch point to the most suitable person in the bank or self –service portals with 98% accuracy the first time. Odigo’s proven cloud based architecture and pay per use model reduces TCO – all-in cost model (full service, hard/software, licenses, maintenance). Natural Language: Customers are asked to state the reason for their call instead of choosing from a list of options to get their request handled quicker. Voice Biometry: Enhances authentication rate with customer satisfaction and security to access sensitive information. Speech and Sentiment Analytics: Analyzes customers’ mood to tailor services by tone and word analytics to improve quality of service. Smart Call: Customers can see their waiting time to connect with a representative via a smartphone and web app. Virtual Assistant: Through smart chat analytics, virtual assistants give a human touch to critical customer touch points. Mobile Private Messaging: Offers customers the convenience of anytime, anywhere customer service. Touch Screen Mobile app Monitoring: Managers can do remote monitoring of capacity and performance of a contact center. Video Calls: The WebRTC technology allows a smooth video experience between customers and advisors with no plugin. Capgemini is a proven banking system integrator having delivered more than 1,000 projects in the banking industry. We have deep banking process knowledge built from over 20 years of banking advisory and technology experience and currently serve 8 of the top 15 global banks. Combining software, hosting and operations, Capgemini offers banks one-stop implementation, which simplifies the service relationship and results in stronger SLAs due to single supplier accountability. We bring deep expertise in cloud orchestration, consumption models and integration and an agile change management approach. 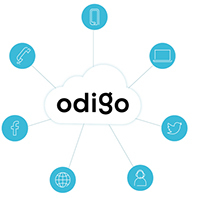 Our global scale and reach enables us to implement Odigo anywhere you need it. Learn how experience-led banking drives desired and profitable customer behaviors like referrals and buying additional products in digital channels. View our webinar American Banker Experience-led Digital Banking: Getting Customers to Buy with Low Cost Digital Channels or download the presentation. To help you familiarize with the solution, we have demos available which showcases the solution features and the benefits that you can achieve with Odigo. Register today for a no-obligation demo or contact us at banking@capgemini.com to learn more. Video highlights of the findings of the World Retail Banking Report 2017 from Capgemini and Efma where the future of Open Banking using Application Programming Interfaces (APIs) is explored. The 2017 report includes insights on the revenue generating potential of APIs, which are the key enabler for Bank/FinTech collaboration in the Open Banking era.